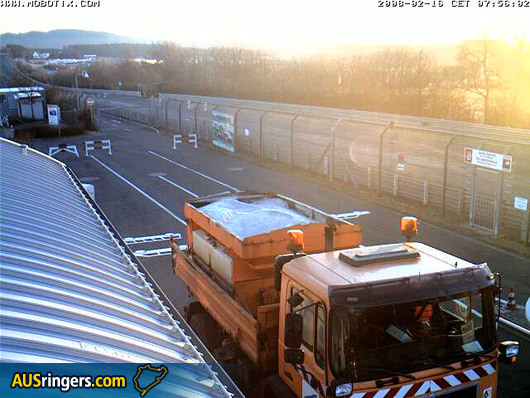 There I was, sitting at home bored on a Saturday, so I checked the Nürburgring webcam and spotted something unusual, a gritter at the barrier. 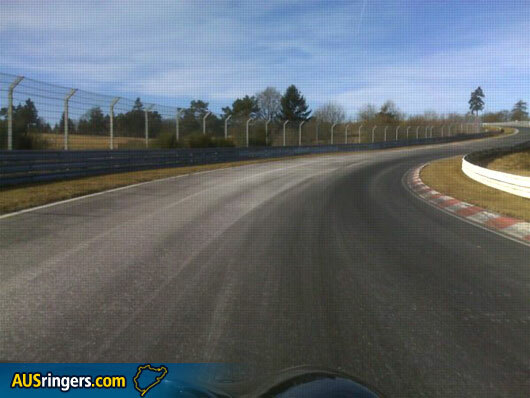 I was under the impression they didn’t salt the Nordschleife. I’ve seen it closed due to ice plenty of times before and no salting was done at those times. Its also remained closed on other days this winter when its been fine and dry, but cold. I checked the webcam a couple more times that morning and then lo and behold, the track was open! I figured the conditions woud be dicy but since I had no plans for the weekend I might as well hang out there as sit around home. I arrived at about 3pm and set about doing a few gentle laps. The track was dry apart from a few patches in the usual shady spots and with the winter sun so low it was never going to reach them. The heavy salting had been mostly blown from the driving line but off line, where the salt remained, it was diabolically slippery, more like a gravel road than a sealed one. 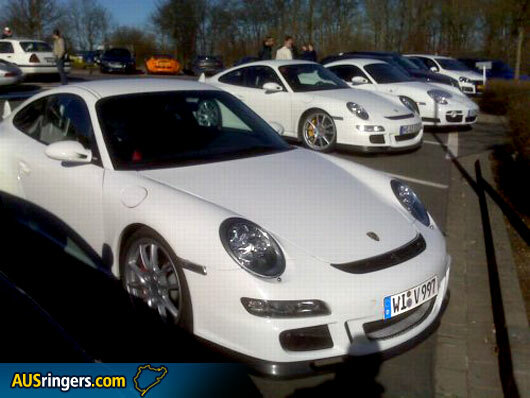 The carpark was surprisingly full but there were no crashes. For a change it seemed everyone there knew what they were doing. A couple of familiar faces were about so I finished lap nine as the barriers closed and headed to the Pistonklause for some beers and laughs. It was good to meet for the first time a couple of regulars I know from the forums. 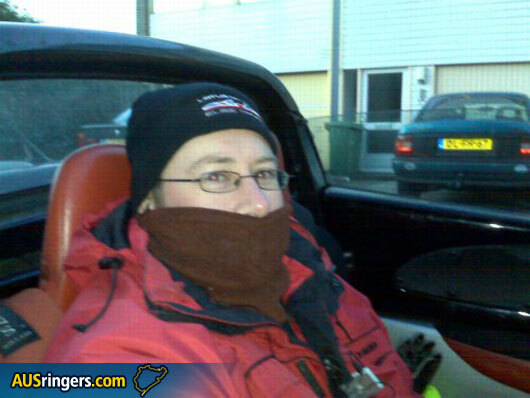 Two of the guys work for Ruf and sometimes get to deliver 700bhp Porkers around Europe, why can’t I have a job like that? I figured the track wouldn’t open until at least midday, if at all, so I made no effort to get up early. Despite that, I found myself at breakfast by 9:30. Even more surprising, despite the sub zero temp, the track had opened. 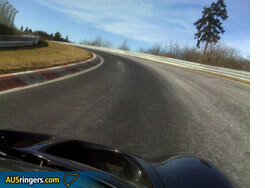 The weather had been clear and cloudless all weekend and so cold there was no dew—the track was dry from the get go. Dry, but OMG the salt! They spread so much it looked like the track was under snow. Exiting the kink at the end of the cones I could get fully sideways at 2000rpm in third, and hold it there well up the straight. I didn’t think to take a pic until late in the day when the line was clean and most of the salt offline had been blown away but you get the idea from these shots; first one near Schwalbenschwanz, second one near the mini Karussell. 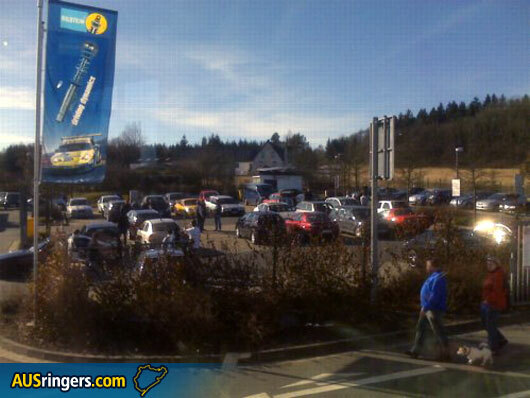 The carpark was again quite busy, with even quite a lot parked in the overflow across the road. As the salt started to clear from the line grip gradually increased from none to minimal and what started off as plain scary started getting entertaining. No matter how hard you tried to work the tires the slick layer of salt dust and the freezing track prevented even the slightest warming. Back to back laps left the tyres cold to the touch. No grip = no heat = no grip! The day was again remarkably crash free, and (relatively) fast too. I think the time of year and conditions filtered out all the numpties so the traffic was mostly old hands. 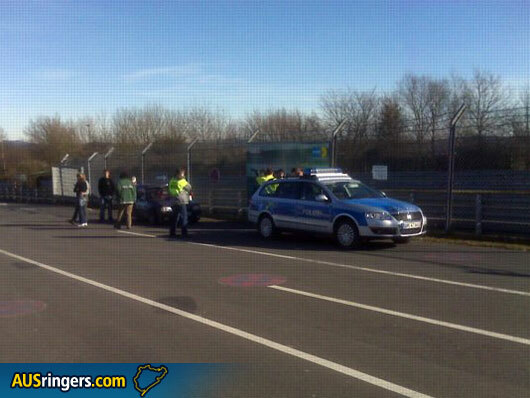 That said it wouldn’t be a day at the Ring without a decent crash and there was a closure of about an hour in the afternoon. Back to wandering the carpark then. 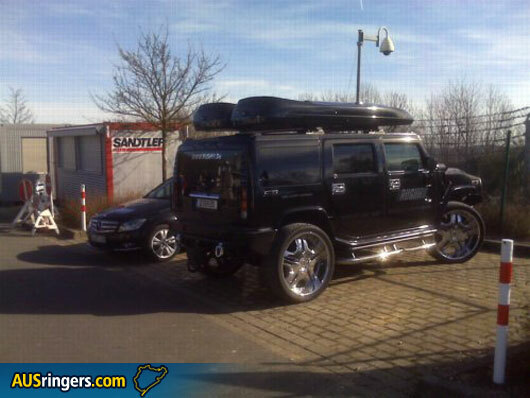 Of course, the carpark has to have at least one clown, this time its a Hummer bling wagon. The wheels totally dwarfing the Merc behind. 28 inches of chrome. 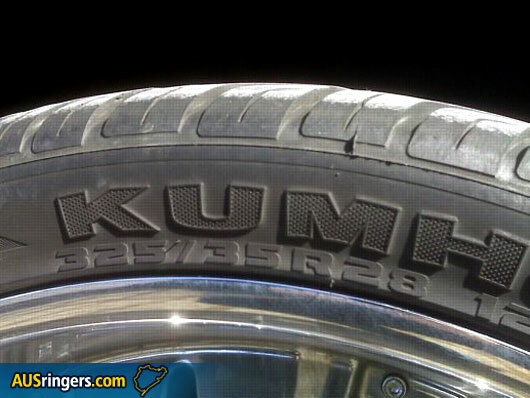 Wheels for the man who never met an inch he didn’t like. The track opened again, so back out sliding all over. By this stage in the day I was comfortable with the bizzare low grip situation and having a lot of fun with the car moving around underneath me more than I ever have before. 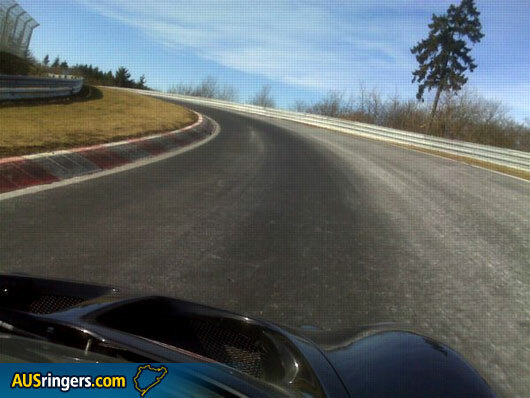 It was somehow much easier than drifting in the wet, as the car wouldn’t get away from you and breakway. It was very progressive and easy to feel. Another five laps to round out a total of 20 for the day. Piled on every item of clothing I had and a roofless run home. I went there expecting to just hang out and catch up with a few friends, but it turned out to be one of the most entertaining days driving I’ve had. Thanks for sharing this report with us Dave. If you have a story you’d like to share, please check out the Your Story page, and if you have something more substantial you would like to share just let me know.